Gmail has, after 8 years of existence, finally overtook Hotmail to become the most popular web based email service. Earlier in the year Google had made such a claim but third party data didn’t agree with its findings. However the latest ComScore data from October does show big G’s email service in front of the pack worldwide, by a nose. Gmail claimed webmail number one spot in the summer but the numbers were a lot more than the ComScore values at that time. 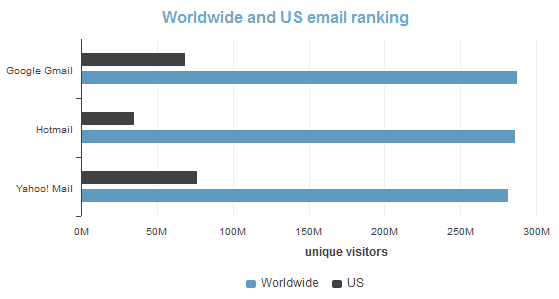 Now with independent third party statistics confirming Gmail’s triumph it looks pretty certainly true. Looking at the ComScore graph it’s not so easy to see, as the race is so close, but worldwide Gmail has 288 million users, Hotmail 286 million users and Yahoo Mail 282 million users. In the US the story is pretty different with Yahoo Mail as the leader at nearly 77 million users, Gmail in second place with 69 million users and Hotmail with 35.5 million users. GigaOM speculates that the Hotmail figures might be affected by the recent introduction of the new Outlook webmail service and the migration of users to that. Also I think you have to ask about how many Android users sign up for Gmail but actually use Hotmail or Yahoo Mail or another service as their primary webmail account. 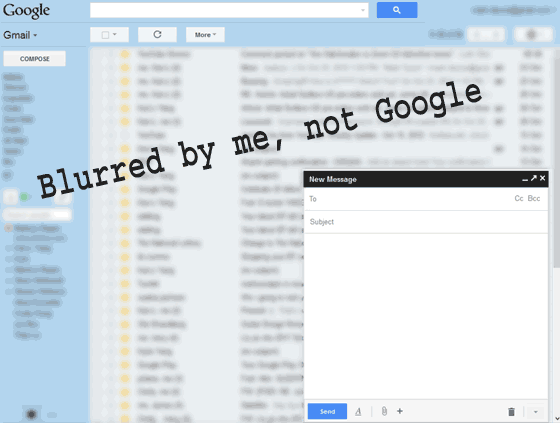 In related news Google has unleashed a new Gmail message composer. 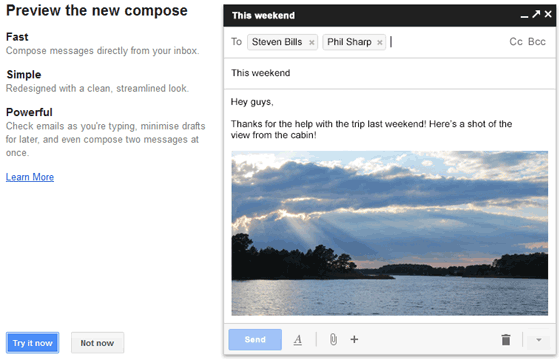 I’ve just gone to Gmail and hit compose, and then up popped the screen above, describing the benefits of the new composer. Once enabled, when you hit “compose” a window pops up in the lower right of your webmail screen very much like an oversized Facebook chat window, beneath the window you still have a good view of your Gmail mail box (see screenshot below). You can navigate around your mailbox and then go back to the editor as you wish. The new composer isn’t resizable as is, unless you “pop out” a window from it using the arrow. Also clicking the black bar toggles it from open to minimised. I doubt if its the most used, I only set up a gmail address so I could join You Tube, and never ever use the address for sending and receiving mail. If you own an Android device and you want to purchase or download anything you need a Gmail account. Yeah, my google registered non-gmail account wouldn't work with Android so I had to create a gmail account just for that. They're all linked to the same google account which is nice and I have started using the calendar, but I don't use it for normal emails. Are they counting all the businesses that have kept their domain but use Google Apps?